Part of what we are about here at Lexus is increasing exposure to other languages, opening doors to other forms of self-expression. There was a great example of this the other day at a Lothian primary school. P5 pupils at Grange Primary in Bo’ness came to watch a performance of our book called Mess on the Floor at their school last month as part of a series of readings and performances organized by bookshop owner Sally Pattle of Far From the Madding Crowd in Linlithgow. Peter Terrell and Elfreda Crehan from Lexus performed the wacky little story about the troubles of a cat, doing this in a mixture of English and French. The class were very vocal at calling Peter the Cat to come out from behind the screen onto which the book pages were projected and did this very convincingly and loudly in French, shouting out minet, minet! In the story in the book the cat is pelted with objects by a little toddler. 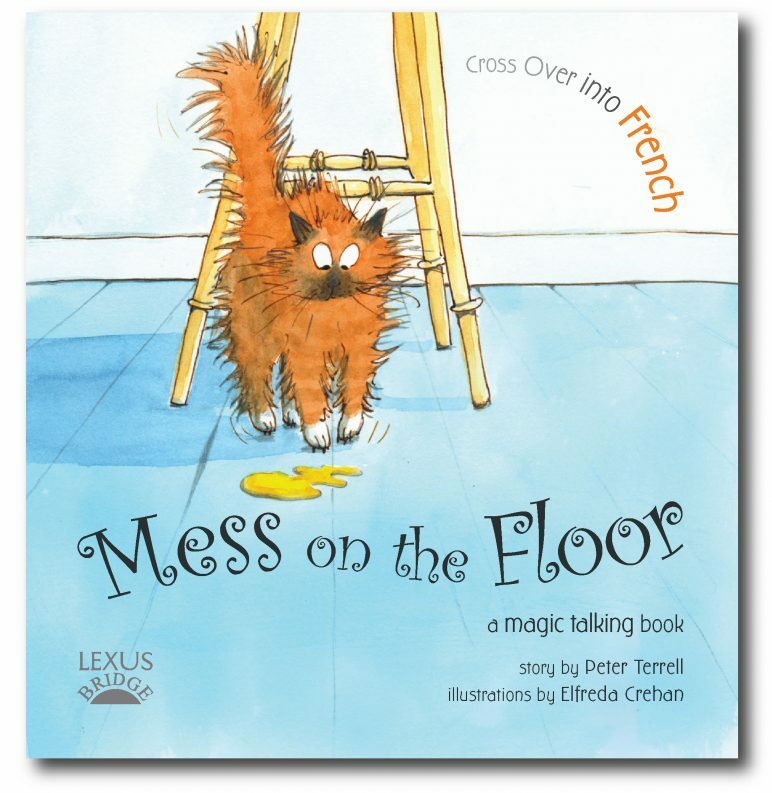 So we put this into practice and the front row of the class were invited to pelt Peter the Cat with (fairly soft) objects, which they did with great gusto. Not too serious a language event, you see. It should also be said that, after the performance, when there were a few questions about the French, the pupils showed that quite a bit of the French which they had just heard had been taken on board. After this performance of Mess on the Floor there was a another reading, again with Elfreda’s artwork projected on a screen, but this time it was a traditional Scottish folk tale with a magical kind of theme. This folk tale also had snippets of French worked into it. The great thing was that here was a class of young children being entertained by a couple of enacted stories which were partly in a foreign language. Maybe there were some linguists here in the making.